Phnom Penh Crown completed a thrilling 2-1 victory over Neftchi Kochkor-Ata in their AFC President’s Cup finals match yesterday at the Kaohsiung National Stadium in Taiwan. 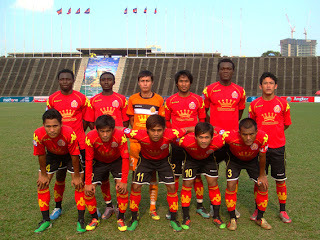 The Cambodians saw their Kyrgyzstan rivals, who beat them 1-0 in the group stage, reduced to nine men during the game and will now hold strong hopes of advancing to the grand final by overcoming reigning champions Yadanarbon of Myanmar tomorrow in their remaining group tie. 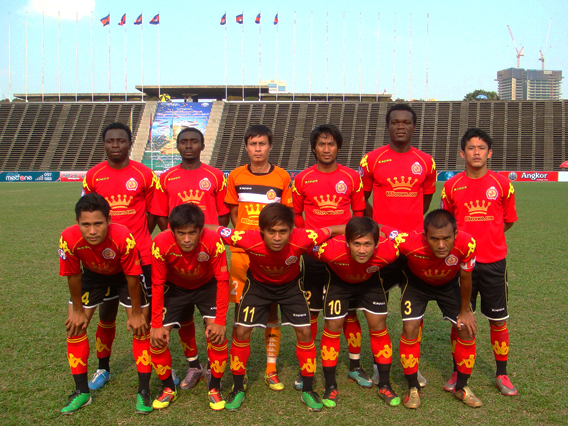 Crown had the measure of things in the opening stages yesterday, coming close through Kouch Sokumpheak while Chan Chaya saw his penalty claim waved away for offside. On 34 minutes, Crown’s Nigerian striker Kingsley Njoku produced an exquisite chip over the Neftchi keeper to open the scoring. The Kyrgyzstan side were then reduced to ten men after Sardorbek Askarov was given a straight red for a flagrant foul on San Narith. On the stroke of half time, Njoku was tripped in the area only for Narith to see his spotkick saved. Shortly after the restart, Crown edged further in front through another delicate lob by Chan Chhaya. Neftchi chased the game well despite being a player down and managed to peg one back via an Iliaz Alimov strike on 80 minutes. However, Aibek Orozaliev also received his marching orders late on as Peng Bunchhay made a dramatic fingertip save in stoppage time to ensure Crown took all three points.